Prince is not a name I would ever have chosen for my horse. Having grown up watching “Fury” and reading books like “Midnight” and “Black Beauty,” I had always dreamed of having a horse that was spirited and beautiful, and I wanted it to be named accordingly. But Prince was eight years old when I got him and already knew his name, so I had no choice but to let him keep it. He was handsome, with a copper-colored coat, a black mane and tail, and a white stripe down the middle of his face. He was a calm, easy-going horse rather than a spirited one, and since I was fourteen and inexperienced when I got him, that was a good thing. 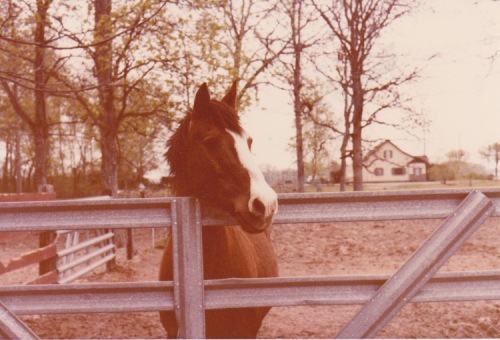 My first horse, Gypsy, had been very spirited, and after she had bitten, kicked, and bucked me off, I was more than ready to appreciate a horse who actually seemed to like people. Honestly, Prince liked people more than any horse I have ever known. I got him a couple years after my family had moved to a small town in Kansas, and kept him at a small stable where he had access to a large pasture. Everyone else at the stable had to spend some time catching their horses when they wanted to ride them. I simply called Prince and he came trotting right over, eager to see if I had some food for him, which I always did. He was easy to ride as long as I made it clear that he wasn’t allowed to stop and graze along the way. Even when I wasn’t feeding or riding him, Prince always stayed near me when I was at at stable, occasionally resting his head on my shoulder or nudging me hopefully to see if I would give him a treat. His only real vice was that he was a pig about food, and the only way he would ever hurt anyone is if they made the mistake of standing between him and something he wanted to eat. Prince believed that the shortest distance between him and his next meal was a straight line, and if someone was standing in his way, he would not hesitate to plow right into them. But other than that, he was so calm and friendly that just about anybody could ride him, and I had more than one friend get over their fear of horses just by being around him. I admit I spoiled him a little, at least by the standards of some people. He loved apples, but would only eat one if I “started” it for him. That meant I had to bite a chunk of it off first, give him the chunk, then hold the apple while he took a bite himself, and then finally he would take what was left of the apple and eat that. He also expected me to swat away the giant horse flies that sometimes landed on him and bit him when we were riding, even if that meant dismounting to swat one off of his leg. I would be lying if I said the more experienced horsemen I sometimes rode with were impressed with the way I handled my horse. Prince came into my life when I was fourteen and he was eight, and he stayed a part of it for seventeen years. When my family moved to southern Illinois, we took him with us, even though I was heading off to college in Iowa. When I married and moved to St. Louis, I moved Prince to a nearby farm in Missouri. By that time it was sometimes hard to pay all the expenses that come with owning a horse, but I never once considered selling him. We had been through so much together. When my teenage years got a bit painful or confusing, I could always find peace by going to the stable and spending time with Prince. 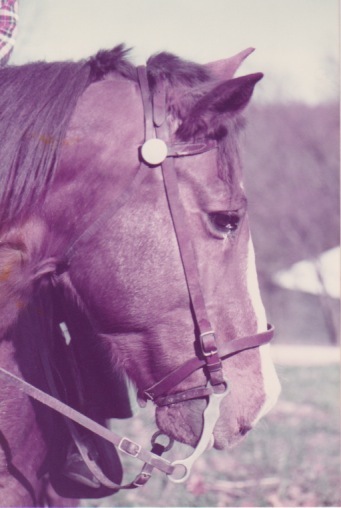 Riding him on my breaks home from college was always something to look forward to, and later, when I moved back to the large city of St. Louis, I treasured my weekend rides on Prince out in the country. He was a constant in my life during a time when almost everything else was changing so quickly. I had to say goodbye to Prince when he as twenty five years old and his arthritis made it impossible for him to move around freely anymore. I knew it was time to let him go when just walking across his stall caused him real pain. It was one of the hardest decisions I have ever made, and I still miss him, all these years later. And even though I didn’t realize it when I first got him, his name fit him perfectly. He really was a prince of a horse. He looked like a beauty and my guess is he was even more beautiful to you in so many other ways. What a great memory to have of something that was so much a part of your life and was with you as you grew up. What a beautiful horse and my guess is he was even more beautiful to you in so many ways. How lucky you were to have something that was so much a part of your life as you grew into a woman. Thanks, George! He was a very special horse, and so beautiful in every sense of the word. I’m not sure why your comments went into my “waiting for moderation” line, but I think I fixed that! What a sweet story of a girl and her sweet horse. You were so fortunate to have him through those years. What a prince he was. I thoroughly enjoyed reading this Ann. Oh,thanks for the story . Yes I teared up. I’ve had to any goodbye to so many horses, but there will always be the One. I still cry. Every girl needs a horse. It sounds as if you know exactly what I mean…. Thank you! What a lovely story, sad too. This brought tears to my eyes. I think anyone who has ever had to put down a pet because of infirmity or illness could identify with you. Yes, so many people know how hard that is! Thanks, Dena! When I was a child I liked to imagine I had a horse hidden in the barn. I took lessons once, but I had to settle for the company of animals I couldn’t ride and just leave horses in my imagination. You make it sound just like my pretend horse would have been. He was so much like a dream horse in so many ways! He had been born on a farm with seven girls, so I think he got used to lots of human contact while he was still very young, which made his personality more like a dog’s than a horse’s. He was far from perfect, and he had some health issues in his later years, but he really was a wonderful horse. I know how lucky I was to have him. PS After WordPress put a photo of him on my last post, I figured maybe that was just a sign that it was time to tell Prince’s story! Lovely and touching stories. Nothing like our animal friends to forever touch our hearts! How lucky to have a friend like this……. Thank you! I know I was very lucky. He was a “once in a lifetime” horse. I think Prince must have been one of your Guardian Angels, in equine disguise. I think you may be right! Thanks Ann. I think of Brook most every day and am so thankful I had him I my life. Its really hard to let them go. Thanks, Patty! I thought of you and Brook when I was writing this. I knew you would relate to it. Such a beautiful story. Here’s to our beloved four-legged family members!!! Thank you! Yes, our four-legged family members mean so much to us, don’t they? I’ve only ever “ridden” a horse once or twice at fairs and that kind of thing, but I have heard before that the personality of each individual animal makes a HUGE difference. It sounds like Prince had a very sweet personality. I’ll bet he was fun to ride. He was! I was very lucky to have him. Although he did like to swim in creeks, even when I was riding him…. But horses, like people, are allowed a few faults!